My name is Wally Boyd and I’m about to arrest Simon Reid for being a pain in my behind. But first let me give you some background info. I’m the chief of police in Scumble River, IL. Although I’m originally from Texas, I moved here nearly twenty years ago to take my first job as a police officer. That’s when I met Skye Denison. Even then, I thought she was beautiful and smart and funny, but she was only sixteen so I didn’t allow myself to think of her as girlfriend material. When she graduated high school she moved away, but I never forgot about her. By the time she came back to town, twelve years later, I was married—big mistake. I got divorced soon afterward when my wife left me for another man, but by that time Skye was dating Reid. I knew he was no good for her. He wanted to change her, to crush her spirit and mold her into what he thought was the ideal woman. Finally, Reid showed his true colors and Skye saw him for the emotionally closed and controlling jerk that he is. Believe me; I didn’t waste anytime in asking her out once they broke up. We’ve been together for two years now, and just a few months ago Skye accepted my marriage proposal. Too bad, we’ve run into a couple of obstacles. 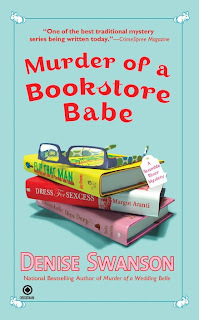 You can read about the first snag in our new adventure, Murder of a Bookstore Babe, but I’ll tell you about the most annoying one—Simon Reid. Reid has decided he will do anything to win Skye back. He’s tried every imaginable stunt from the serious to the absurd—think singing knight in shining armor telegram. So far Skye’s resisted, but I’m a little worried. Why did she let him blog here first? Should it have been me, her fiancé? Also, she might be getting a bit impatient with the other snag I mentioned. Now that I have a second chance at happily ever, it would kill me if Skye changed her mind. How about you? Did you get a second chance at love? Wally, don't worry. I doubt that Simon's antics impress Skye. Not favorably, anyway . I agree with Janet. Skye's much too savvy to fall for Simon's antics. I hope! Wally, think of it this way, Skye saved the best for last. Hang in there, Skye will tire of his antics. I think she already is tired of his antics. She loves you Wally and wouldn't have said yes if she wasn't 100% sure you were the right man. Stay the course, I would say, and don't waste time thinking about the other guy. Have faith! Wally don't worry if Skye takes Simon back then she is out of her mind. Just stick by her and things will work out. Wally I sure hope you and Skye get married soon! !I am 66 years old and I do want to be alive to read the book it is in and since it takes a long time in between books I dont know if I will be here to see the marriage!! I sure dont want her with Simon,he is too sneaky!And she did kinda lie to you in Murder of the Bookstore Babe so dont lie to her again and she promised not to lie to you again! I really appreciate the good advise from you all. Kelley, I promise never to lie to Skye again, so please give me another chance. The good news is there's going to be another Scumble River mystery out in October, so less than 7 months until the next adventure unfolds. Keep your spirits up, Wally. Skye is such a great gal, it's worth having a few bumps in the road.